Picking pumpkins... Harvest done! Welcome to our pretty little Autumn cottage! Imagine spending some time in this sweet little Pumpkin Cottage by the sea. 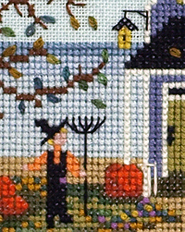 This windy scene brings out all the colours we associate with autumn, Halloween or T hanksgiving. The orange pumpkins make a colourful contrast with the purple cottage, the yellow sand, white fencing and the black roofs. Can you imagine what fun it would be staying in this getaway cottge? Maybe with some hearty soup on the stove, while you sit out on the sunny verandah to wait for the family to finish raking the leaves? The linen used is a bright sky blue, to show how beautiful those lovely Fall days can be. There is an Accessory Pack of silk threads and pumpkin buttons for your convenience. You don’t have to use the linen we chose, so enjoy finding your own favorite colour linen to bring this project to life! 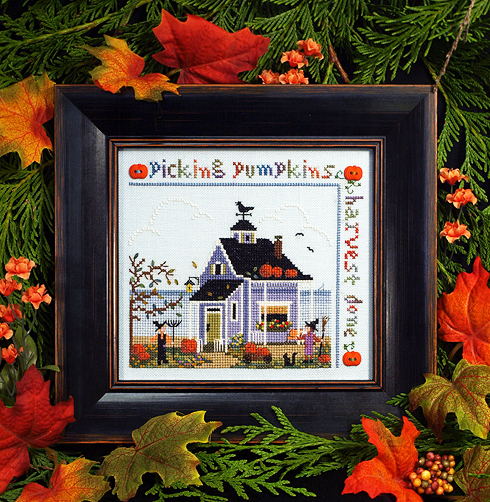 This is a perfect design to hang in your home or cottage to remind you of fun times past, present or yet to come.. in your own little Pumpkin Cottage!